We've been trying to figure out when we last visited Spain and despite our best efforts we can't quite pin down the date. Suffice it to say it's been a while, and we've never been to Barcelona. Our last trip to Spain was for about 3 weeks and we toured the mid and souther parts of the country on a fantastic road trip. This time around we used Barcelona as a nice landing spot post Morocco and pre-Mexico. Barcelona was on our list of "must see" places ever since our original trip to Spain; and wow, it did not disappoint. The architecture is amazing and there is just this feeling here that is infectious. I'm not quite sure what it is, but this feeling just sort of makes you want to be out all day long and alternating between wandering the beautiful streets and languishing at a cafe. Tapas is done very well here and the resurgence in Vermouth seems to be a very welcome trend. We gorged ourselves on museums, architecture, tapas and other goodness over the course of our stay. We definitely want to come back and experience more of what this country has to offer. There's so much left for us to see. 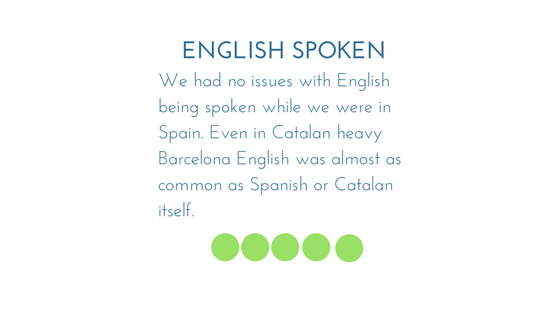 Read, see and hear more about the regions we visited in Spain.